Dear Nadia, From our first meeting I knew I could trust you. You instantly created a safe space and I felt comfortable sharing and just being myself. Through your coaching you helped me focus on the things that really mattered to me; those areas of my life that are most deserving of my time and energy. As a single mom running a business I sometimes try to trick myself into thinking I can do at all. You really helped me to see that sometimes slowing down is actually doing more! I began to be able to think clearly in a way that helped me organize my thoughts and goals. You have a desirable mix of intuition and practical wisdom which helped me to get in touch with those very parts of myself. I feel so grateful for our time together and the gifts that you have given me through your skillful coaching. 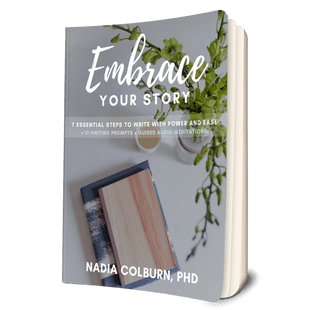 At last I discovered a writing mentor, Nadia Colburn, who dares to value both the craft of writing and one’s personal journey of body, mind, spirit and voice. What I did not expect was how intentionally and lovingly Nadia would hold herself, her students, and the world to that vision throughout Align Your Story. Her profoundly powerful lessons, readings, supporting yoga movements, meditations, and guidance in the weekly phone conversations, met me exactly where I was on my own path. Her insight and candor reached directly to parts of my own unconscious, which responded with an unexpected and welcome shift in a long-standing, recurring dream. Working with Nadia offers this kind of depth of internal movement and self-integration that infuses new life and strength into one’s path and voice.